GBS Laptop Service Center In Chennai provide quality Laptop repair services for all model Laptops - Acer, Apple, Dell, Hp, Lenovo, Toshiba at Reasonable Cost. Our professional technician has many years of experience to handle any laptop related problems. We are experts in broken Laptop repair/rework, motherboard chip level service, broken laptop LCD screen repair/replacement, laptop spare parts upgrade. Currently we provide laptop repair services in and around chennai region - Tamil Nadu : OMR, KK Nagar, Tambaram, Chrompet, Anna Nagar, Adyar, Madipakkam, West tambaram, Porur, Thoraipakkam, Velachery and Trichy, Coimbatore, Madurai & Karnataka - Bangalore For Any model laptop issues need services or spare parts, simply logged the complaint for Laptop repair Estimate and we will schedule and pickup your Laptop, our technicians will help you with the Repair Cost with-in 24Hrs. Alternatively, Call +91-9841603330. Dell Laptop Service Center in Chennai, We Provide ourselves as one of the chennai's finest laptop repair center, Our technicians specialise in repairing all makes and models of laptops like Dell, Hp, Lenovo, Acer, Toshiba, Apple etc., We can offer you a fast and cost effective repair solution for all your laptop need, We offer a convenient and fast service where we can collect your laptop for repair any chennai OMR address may it be work or home. Our laptop service render professional repairs including all brand laptop broken screens, software and hardware upgrades, water damage etc. Our proficient engineers are highly experienced technicians which provides quality repair services. If you cannot see your repair need here, please visit our laptop exclusive service center in omr at kandanchavadi and Thoraipakkam or contact us via Live Chat / give us a call for further details. If yes, you are here at the right place. We offer Remarkable, Cost-effective Repair, Replacement services for all brand laptops with a high quality parts from any of our service centre in omr at kandanchavadi/Thoraipakkam. Our professionals shall guide you with our competent repair so that you can experience excellence facility for quick and convenient solution for all model laptops. Dell Laptop Service Center In Chennai, We provide comprehensive dell laptop repair, upgrade and maintenance services in Tambaram, Chennai. Our service center is equipped with best dell laptop repair technology and tools providing high quality diagnostic and repair services for a wide range of dell laptops. Our Dell laptop repair tambaram team can repair and upgrade all dell laptops including; Dell inspiron, Dell Alienware, Dell Xps, Dell Studio, Dell Vostro, Dell Lattitude models at affordable rates. Contact expert dell laptop service center in tambaram for your entire dell laptop repair and upgrade requirements. Also sell all model refurbidhed dell laptops at our dell service center in Chennai. Dell service center technicians are completed well-qualified to diagnose the problems of your laptop, troubleshoot and repair almost all Dell laptop Issues including a malfunctioning. Our Dell Laptop Engineer are specialists in treating Dell laptop issues caused due to power supply issues, accidental spillage of liquids, software issues, physical cosmetic damage, and overheating. 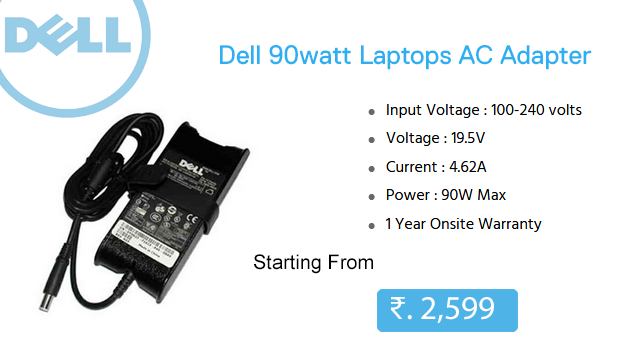 Dell Laptop Service Center in Chennai offer's instant solutions for many laptop problems. 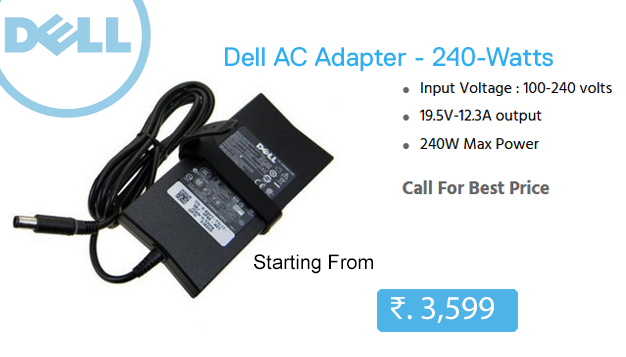 Our Chennai dell service center take utmost effort to make you satisfied. we provide an excellent service to your dell laptop. Dell Laptop Service Center in OMR expert team of IT professionals can help solve all your dell laptop needs, We are specialized in servicing dell laptops with 90% success rate. We provide the most genuine replacements of the dell parts with written proof of the originality of the spare parts. So, visit our dell service store OMR at chennai and get your laptop repaired! For any dell laptop related problems contact our dell service center omr, Our experts will guide you to get the best service according to your requirement. Welcome to Laptop Service Center in Chennai. LAPTOP SERVICE @ GBS™ is one of the leading laptop Service provider in Chennai. We having 10+ branches OMR, KK Nagar, Anna Nagar, Porur, Velachery, Tambaram, Thoraipakkam, Adyar, Madipakkam, West Tambaram in Chennai. And we have 23years of experience in Laptop Service Industry. Our service engineers have well knowledge in Repair/Service any kind of Laptop Problems or Issues. We do all range of Laptop repair/service for all Major branded Laptops like Dell Laptop Service in Chennai, HP Laptop Service in Chennai, Lenovo Laptop Service in Chennai, Acer, Apple, Compaq, Toshiba, Sony, Samsung Laptops. Our trained Laptop Service technicians are well-qualified to analysed Laptops, troubleshoot and repair almost all problems including a fault keyboard, power surges, failed power jack, booting issues, and a dim or flickering LCD screen. We afford laptop repair services to many business, schools and government organizations. Laptop Service at GBS™ have branches at Madurai - Simmakkal, Coimbatore - Peelamedu | RS Puram, Trichy - Thillai Nagar. Now we offer for Franchise in Tamil Nadu, who are interested in this field we'll ready to increase your growth. 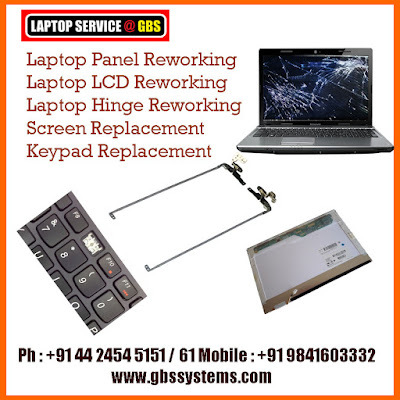 GBS Laptop Service Centres in Chennai provide professional laptop repairs, replacement and upgrade service and we take care of your laptop problems and gives perfect & instant solution, also we offer genuine laptop spares for replacement. Contact our Service & Repair Support Call at +91 98416 03330/32. We are specialized in Laptop Chip-Level Services, Motherboard Replacement, Keyboard Repair, LCD/LED Screens Replacement, Hinges Rework, Broken Laptop Repair, Hard Disk Issues, Data Recovery, Panel Rework and etc. We provide our services at all over Chennai - Adyar, Annanagar, KK Nagar, T Nagar, Nungambakkam, Vadapalani, Chetpet, Mogappair, Guindy, Tambaram, Velachery, Madipakkam, Chromepet, Porur, Thoraipakkam, Ashok Nagar, Virugambakkam, Nanganallur, Pallavaram and etc. For Futher details walk in our authorized Laptop Service Centers In Chennai - OMR | Tambaram | Anna Nagar | KK Nagar | Velachery | Madipakkam | Adyar | Chrompet | Porur | Thoraipakkam | West Tambaram | Coimbatore | Trichy | Madurai Call our customer care number 9841603332 get a instant solutions of your laptop problems. Dell Laptop Service Center in Chennai GBS is one of the leading laptop service providers in Chennai. We offer wide range of Laptop Repair and Services like Laptop chip-Level Repair, Laptop Motherboard Re-work, Broken Laptop Services, Data Recovery, Hard Disk Repair, Screen & Keyboard Replacement and Laptop RAM/Harddidk Upgrades. We provide an excellent solution for all major laptop issues in Dell, HP, Lenovo, Apple, Acer, Sony, Toshiba, Compaq laptops. Our well trained technicians provide a quality and professional service. We focus on quality service to make our clients or customers Satisfaction. We repaired more than 1000 laptops per month with best original laptop spare parts and accessories. Whenever you need to repair your laptop, we will solve your laptop problems - you can call us at any time +91 9841603330. We offer our laptop service support in all over Chennai - Adyar, Annanagar, Alwarpet, Ambattur, Adambakkam, Besantnagar, KK Nagar, Chromepet, Chetpet, Ekkattuthangal, Guindy, OMR, Sholinganallur, Navallur, Ashok Nagar, Tambaram, Porur, Vadapalani, Kodambakkam, Poonamalle, Nungambakkam, West-Tambaram, Pallavaram, Mudichur, Tharamani, For other Locations call to our customer service : +91 9841603332. Laptop Service @ GBS™ was started in the year 2009 with an aim to server the tech-savvy customers and address the need for effective laptop service solutions. The brand is owned by GBS Systems & Services Pvt. Ltd., started in the year 1994, a reputed name in the field of multi-brand computer sales and service. GBS has a rich experience of more than 24 years in satisfying more than 10 Lakhs customers with its quality services. Our Laptop Service Center has helped in fastening the growth of other industries by providing a strong back-end technical support to leading organizations and corporate ensuring smooth functioning of systems and processes. We have 15 Exclusive Service Centers in the state of Tamil Nadu [OMR | Adyar | Anna Nagar | Madipakkam | KK Nagar | Tambaram | Velachery | Porur | Thoraipakkam | West Tambaram | RS Puram Coimbatore | Peelamedu Coimbatore | Simmakkal Madurai | Trichy Thillai Nagar | Bangalore ] and have earned a respectable position in the field of after sales service of laptops. GBS Systems is also an Authorized Dealers for all Major brands like Dell, HP, Lenovo, etc. currently we operates 3 Dell Exclusive Stores, 5 Lenovo Exclusive Stores & 2 Hp World & 1 Multi Brand Outlet in addition to its Service facilities. Dell laptop service center in OMR is a No: 1 dell Laptop Service center in Chennai. In Our OMR Dell Laptop Service center offer an excellent service repair at affordable cost in Chennai. Dell Service Center OMR expert have well knowledge for giving the best service of any dell model like inspiron, alienware, xps, vostro, studio, precision etc. If you need quick and reliable repair, upgrade and maintenance services, contact our OMR Dell Laptop Service at 9841603330/32. Laptop Service Center in Chennai GBS is one of the leading Dell laptop service providers in Chennai. We offer wide range of Laptop Repair and Services like Laptop chip-Level Repair, Laptop Motherboard Re-work, Broken Laptop Services, Data Recovery, Hard Disk Repair, Screen & Keyboard Replacement and Laptop RAM/Harddidk Upgrades. We provide an excellent solution for all major laptop issues in Dell, HP, Lenovo, Apple, Acer, Sony, Toshiba, Compaq laptops. Our well trained technicians provide a quality and professional service. We focus on quality service to make our clients or customers Satisfaction. We repaired more than 1000 laptops per month with best original laptop spare parts and accessories. Whenever you need to repair your laptop, we will solve your laptop problems - you can call us at any time +91 9841603330. We offer our Dell laptop service support in all over Chennai - Adyar, Annanagar, Alwarpet, Ambattur, Adambakkam, Besantnagar, KK Nagar, Chromepet, Chetpet, Ekkattuthangal, Guindy, OMR, Sholinganallur, Navallur, Ashok Nagar, Tambaram, Porur, Vadapalani, Kodambakkam, Poonamalle, Nungambakkam, West-Tambaram, Pallavaram, Mudichur, Tharamani, For other Locations call to our customer service : +91 9841603332. Dell Laptop Service Center in Chennai bring their work to us for comprehensive repairs and upgrade services offered by specialist Dell Repair team of computer hardware engineers and software experts, We are specialists in all model dell laptops screen, motherboard, keyboard, hard disk repair services, also sell genuine dell laptop spare parts and accessories at very cost effective price. This dell service center chennai can meet the entire repair requirement for any model dell laptop (alienware, inspiron, vostro, studio, xps) services or dell laptop spare parts replacement services. Dell laptop Repair centre chennai providing repairs, upgrades and part replacement services of all model dell laptops. We are chennai dell laptop service specialist based in Tamilnadu, provids comprehensive Dell laptop repair and maintenance services, our reputable Dell repair centre chennai offering dependable and reliable dell laptop repair, upgrade services at affordable rates. Our dell service center in chennai team members of staff have good technical experience to diagnose and carry out fast and professional Dell laptop repairs and maintenance services. Our dell repair service chennai is highly rated by previous and present valued customers, call expert Dell Service Center in Chennai for all your dell laptop needs (Repair/Spare Parts) We support all model dell laptops repair/sale here .